The French Macaron has been the rage for foodies here in the Philippines for months now and it looks like there is no stopping this meringue based pastry from becoming everyone’s top favorite treat! It’s got to be the colorful looks and yummy taste that appeals to the Filipinos from across all ages. We bet you love this pastry too! But making one is not easy even if you have all the right ingredients, this is the truth that we’ve learned when We Love Cebu was invited by Waterfront Cebu City Hotel and Casino to meet and greet their new Executive Pastry Chef Schihab Ahmed. This vibrant chef shared that technique is crucial in ensuring that this delicate pastry is bake to perfection. Chef Ahmed, or Chef Adam to friends and co-workers, is from Maldives and has a very extensive experience in the pastry and desserts business thanks to his studies and stints at various luxury hotels both back home in Maldives and in other countries. He is also one chef who does not want to rest on his laurels so right now he is also looking forward in completing his Masters Degree in International Management from the University of Liverpool, a dream he has since childhood. Together with his staff in Waterfront Cebu headed by Chef Marlou Basnilla, they’ve combined various pastry techniques and local ingredients to create wonderful desserts that everybody will definitely enjoy. 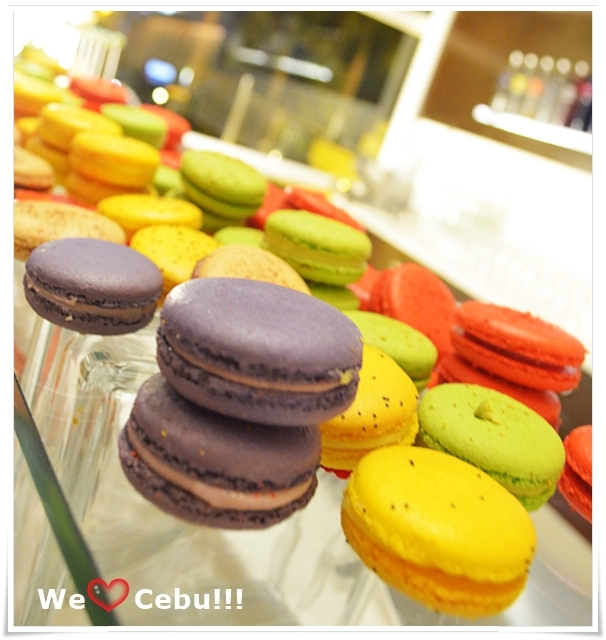 One pastry that every Waterfront Cebu guest must try is their French Macaron. 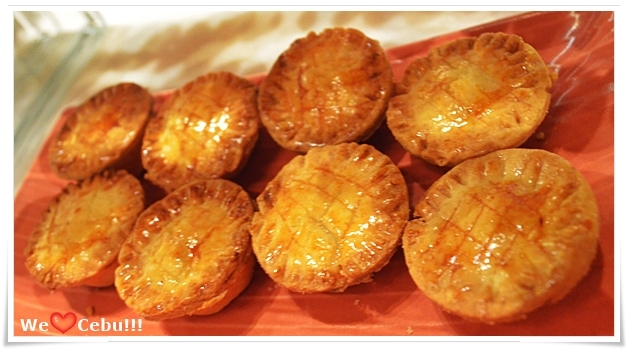 This pastry is known for various flavors like Chocolate, Coffee, Pistachios, and Lemon. Waterfront Cebu does have all these flavors but they also have other exotic flavors like their Ube, Coconut and Mango macaron. Chef Adam, by the way, loves to create desserts made from our local mangoes, for he finds Philippine mangoes as “one of the sweetest in the world”. Their version of the French Macaron is one of the best we’ve ever tasted and one that you got to taste too! You’d be surprised to know that their French Macarons are sold at very affordable prices, even priced lower compared to those sold at malls, but theirs have better quality and bigger size. A truly must try during your Cebu Food trip and dessert cravings!!! 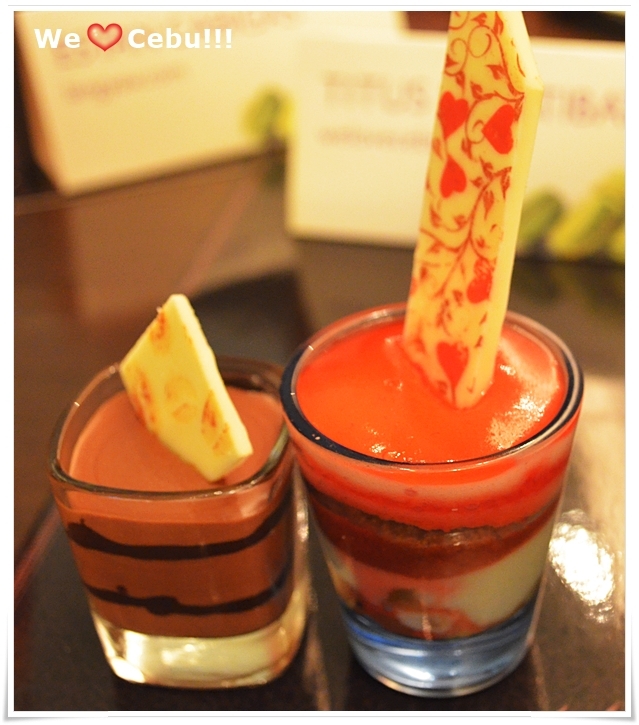 The Waterfront Cebu pastry team are also passionate in promoting local desserts and “Merienda”. During the “Sweet Avalance” event in the Treff Bar they proudly served their versions of Pinoy favorites “Banana Que” and the “Buko Pie” in tart sized servings. Strawberries dipped in chocolate and others. 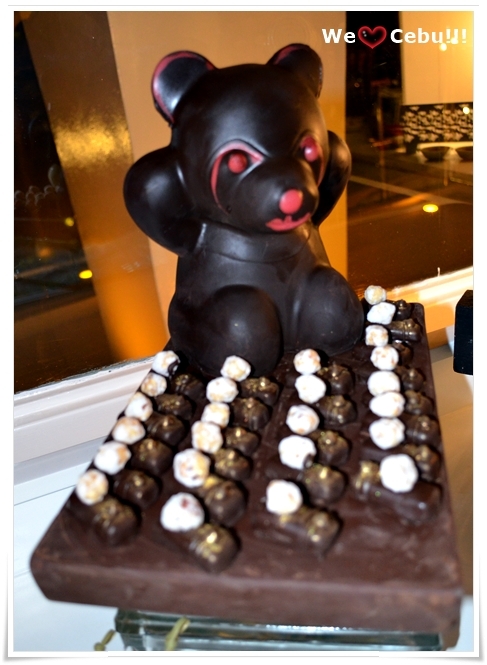 Their chefs use the finest Swiss Chocolate for their creations and even their decorations like that of the bear above which is made from of 1.5 kilos of pure chocolate. You can get all these pastries and desserts when you visit the Madeleine Restaurant and the Treff Bar located in the Waterfront Cebu City Hotel and Casino’s Gourmet Walk area. For more information or reservations you may contact the Madeline Restaurant at at 032 6888 local 8629. Like We LOVE Cebu on Facebook for more exciting food finds here in the Queen City of the South!! !